Welcome to the home page of Sengé Chow Chows. We are based northwest of Melbourne in Country Victoria, AUSTRALIA. We are so glad you have dropped by to meet us and our Chows. Our kennel name (actually our breeding prefix), Sengé, is a Tibetan word that means "lion" or "lion-faced". It is pronounced sen-gay. Given the faces of our Chows and the reactions we often get from children ("Mummy, that lady is walking a lion! "), we thought it was a pretty appropriate prefix to choose! The Chows Chows at Sengé Chows own two humans, whose call names are Brian and Judith-Ann. We do actively exhibit our Chows and will, from time to time, arrange a breeding. Our philosophy in breeding is that we breed for ourselves and only when it suits us and our Chows. Our primary goal in breeding is to emphasise a balance in soundness of body, temperament and type. We also admit that we place an emphasis on function followed by form, which is not to say that we ignore form. And good health in our Chows is important to us, so we health test our Chows before breeding them. We recommend that anyone in Australia looking for Chow pup of any sort contact either the Chow Chow Club of Victoria or the Chow Chow Club of New South Wales and request a copy of their Club's Breeders List. We would strongly urge you to avoid puppies sold in pet stores or by individuals who are not registered as breeders with their state or territory ANKC affiliated canine association. 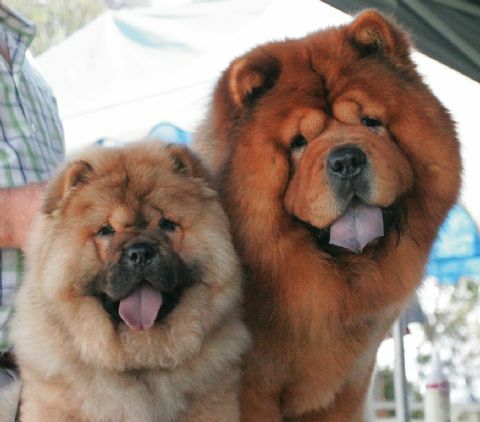 We are active members of Dogs Victoria (previously known as the Victorian Canine Association), the Master Dog Breeders & Associates along with other clubs as owners, exhibitors and registered breeders of Chow Chows. Our web site is always under construction, but we want to have it set out so that you will get to see pictures, learn about the breed, and find out what our lovely Chows are getting themselves into. We hope you enjoy your visit. No images or articles on this site may be used without the written, notarized consent of the owner. Any clubs mentioned on this site are neither responsible for nor do they necessarily agree with the information provided in any articles or opinions expressed herein. We don't profess to be experts; in fact, we consider it our responsibility to constantly engage in reading, research, updating and discussing what we learn about Chows and dogs in general with other like minded Chow folk (and other breed advocates). On this website and in the various articles and pages you will find here, we are sharing what we have learned so far in the 35 plus years we have had Chows. There are plenty of people who will agree with us and plenty who won't. Please do your own research and use your own good judgement.